An archipelago of islands in the middle of the Pacific, roughly halfway between the USA and Japan ... though quite a bit south of the direct line between those countries. Once a proud independent Polynesian kingdom, it was gradually taken over by foreign powers, essentially turned into a vast white-owned plantation under a de facto feudal system, and from the end of the 19th century officially became a US territory. It wasn't until 1959, though, that Hawaii became the USA's 50th state proper, the last one to accede to the Union. Given that Hawaii is culturally and geographically so distinct from the rest of the USA, however, it is treated here as a separate country destination. For the dark tourist, at least three of the Hawaiian islands are of particular interest, for very different reasons, ranging from natural disasters to modern warfare. The Hawaiian chain of islands is of volcanic origin, created by the Pacific plate drifting over a hotspot in the Earth's crust, where magma breaks through to reach the surface. Shield volcanoes are the result. Kaua'i, the northernmost of the larger islands, is the oldest and most eroded. The chain of ex-volcanic (ex-)islands, however, continues further north-west, mostly under the sea's surface, except for the Midway Islands and some other small specks of land, and carries on all the way to the Aleutians. At the other end is Hawai'i Island, or Big Island, which is, as its informal name suggests, the largest of the Hawaiian islands and the one where all the volcanic action takes place today. Although the next island-to-be is already taking shape through submarine volcanic growth offshore of Big Island to the south-east. But for now, Big Island is the place to go to see volcanoes in action – it is in fact amongst the world's premier sites for volcano observation, and nowhere else is it so easy and so safe for tourists to engage in this, in particular in Volcanoes National Park (though some of the best bits are often visible from helicopter flights over otherwise inaccessible parts). The island just north of Big Island, Maui, also still bears dramatic evidence of fairly recent volcanic activity (some 200 years ago – the volcano may still have to be regarded as active), in particular in Haleakala National Park. 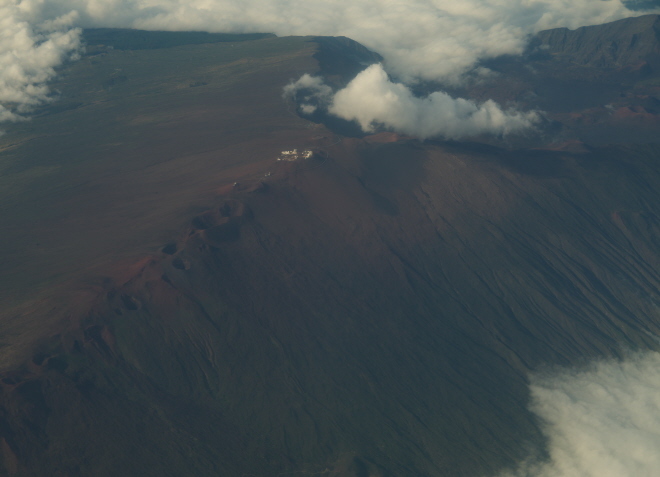 But unfortunately I was not able to go there on my trip in the summer of 2015 – but I caught a glimpse of it flying over from O'ahu to Big Island. Less dramatically visible, and less well known, is the fact that Hawaii has also repeatedly been hit by a very different type of natural disaster, namely tsunamis. Big Island's capital city Hilo was worst hit and the local Tsunami Museum tells the story of this. There is also a smaller-scale but poignant memorial at Laupahoehoe Point a bit further north along the coast. A completely different, but also sad and tragic story is that of the former leper colony Kalaupapa on the island of Molokai, now a highly unusual, and still difficult to reach tourist attraction. The busiest and most densely inhabited island of the whole archipelago is O'ahu. It is home to the state's capital, and only large city, Honolulu. By far the largest proportion of Hawaii tourists flock to Waikiki just south of Honolulu (and most see very little of these magnificent islands other than crowded Waikiki Beach and the densely packed hotel towers and tourist ballyhoo just behind). O'ahu is also of immense military importance. There are several airbases (UASF, Marines, Army, … all have their own) and Pearl Harbor has long been the most significant naval base for the US Navy. This was infamously attacked by Japan in a skilfully orchestrated air attack in 1941, which changed the course of WWII by dragging the USA into it, both in the Pacific and in Europe. The so-called Punchbowl in Honolulu is the largest monument (and cemetery) commemorating the USA's Pacific War. Beyond all these dark aspects, Hawaii is primarily a stunningly beautiful place, combining tropical lushness with towering dramatic mountain scenery and plenty of mesmerizing coastline … and yes, beaches too, but also some of the world's tallest sea cliffs (esp. on Molokai – see Kalaupapa), and the latter routinely impress me more than any beaches (I'm just not a beach person). You don't even have to venture far from Honolulu/Waikiki in order to find some of this. Some of the dramatic inland scenery is easily accessible via good roads leading to prime viewpoints; and the coasts are mostly pretty well accessible too by road (except where there is a military presence, of course). And outside Waikiki, the beaches are far less crowded and developed. Here you still get the picture-book tropical vistas with palm trees, and blue lagoons against a deep green mountain backdrop. However, for me at least, Big Island tops it all. Not only does it offer the widest range of dark-tourism attractions in the archipelago, it also has the most extremely varied scenery, from the dry west coast to the wet east, with rainforest and lava deserts and topped (literally) by the most massive volcanic peaks on the planet. And it's far less crowded than O'ahu! Hilo, the capital of Big Island, also has its unique charm. It's not a big place, in fact the old downtown consists of just a few blocks, but it has a very relaxed and genuine feel to it. This is not a tourist hub by any stretch of the imagination, but it's real. And I liked that, despite the weather … Yes, Hilo is a rainy place, a contender for the title “rain capital of the US”! Because of this, people are likely to tell you that you should make sure to stay on the dry and sunny western side of the island, i.e. the main tourist hubs of Kona. But I beg to differ. I much preferred Hilo. Apart from just being a relaxed, friendly little place it also has a few attractions of its own. In addition to the Tsunami Museum, there's also the Lyman Museum and Mission House, a lovingly old-fashioned affair whose main exhibition mixes themes such as geology, volcanology, mineralogy, biology (and taxidermy!) with local history and culture. (276 Haili St, HI 96720, open Mon-Sat 10 a.m. to 4:30 p.m, admission 10 USD, various concessions apply). Hilo's pioneering farmers' market is highly acclaimed. It's best in the mornings on Wednesdays and Saturdays. Here you can stock up on the freshest fruit and veg of superb quality (making self-catering a very good option when staying here!). But there are also a few good options for eating out. Hilo is also a good base from which to explore the west and south coast, such as Puna with its lava trees, black sand beaches and old hippy communities. Closer to Hilo you can go swimming/snorkelling with sea turtles (e.g. at Carlsmith lagoon). There are also pretty waterfalls not far from Hilo. Rainbow Falls is right on the edge of town, while the fabled Akaka Falls are a mere 15 miles (25km) to the north. For the more adventurous, Hilo is also a good base for tours to Mauna Kea. These are also offered from Kona, but the Hilo ones are more affordable and less formal (I went on one provided by Arnott's Lodge). Mauna Kea and its neighbour Mauna Loa together form the largest volcanic mountain massif on Earth. Both peaks rise to over 4000m (well over 13,000 feet) above sea level … but when measured from their base at seabed level, they are actually the tallest mountains of any on the planet. Unlike the still active Mauna Loa, Mauna Kea is now a dormant volcano. The dry and clean air at the summit has attracted a cluster of astronomical observatories, and thanks to their presence and the access road/track getting to the top of Mauna Kea is comparatively easy (whereas climbing Mauna Loa is proper mountaineering). Going up you'll pass some dramatic volcanic landscapes, including “Moon Valley”, which actually was used for training for the Apollo moon missions in the late 1960s! And when you get to the summit, the gleaming domes of the observatories make for a unique sight, which looks like straight out of a sci-fi or James Bond movie. In theory you can drive up yourself – but you'll need a four-wheel-drive vehicle and most car-rental companies do not allow you to take their cars up there, with only one exception of a local firm based in Hilo. It is a somewhat hazardous drive, due to altitude and steep rough tracks part of the way (break failures are the main cause for accidents on this route). So to be on the safe side, you can rather take an organized tour. These do not come cheap, though – starting from ca. 130 USD per person (from Hilo) and going up to over 400 USD (for private tours). Many of these tours go to the summit for sunset – when you can see Mauna Kea's shadow on the cloud layer to the east, and the sun dipping down golden red in the west. It really is quite spectacular. Stargazing post-sunset is often an extra bonus. The observatories themselves are usually off limits to the public, however, except for the Keck Observatory that allows daytime public access some of the time. On the way up you are obliged to make a half-hour stop at the Visitor Information Station at ca. 3000m (10,000 feet) elevation in order to acclimatize. Altitude sickness is a serious threat further up, and since you're likely to come all the way from sea level, this acclimatization stop is indeed essential. Tour vans/buses usually also carry oxygen supplies for emergencies, just in case. While acclimatizing you can go for short hikes around the centre or visit the exhibition inside the visitor centre. When I was there at the end of July 2015, however, the visitor centre was closed, due to protests by native Hawaiians who objected to plans for another big observatory to be constructed at the summit. The reason for this is that the summit of Mauna Kea is considered a most holy site in old Hawaiian culture, so there is a very concrete conflict between science and religion here! Tourists wanting to go to the summit are not as such targeted by these protests – in fact there was a tented base near the visitor centre in which the protesters invited tourists to come for information about the conflict. But the least they ask of you is not to climb up the very last cinder cone that forms the very summit (the observatories are slightly below that peak). While visiting the summit of Mauna Kea can be considered the top scenic attraction (both literally and figuratively), there is plenty more to see. One classic highlight is the Waipi'o Valley in the north – a deep canyon covered in lush green. Access to the bottom is restricted to 4x4 vehicles and hikers, but there is an overlook platform at the south side. Rivalling Waipi'o is the much less popular and even more remote Pololu Valley at the end of the road that goes round the very northern tip of the island (Rd 270). There's an overlook spot here too. The way down is a steep and treacherous hike – but local tour companies also offer guided tours by special vehicles. The north is generally the least visited part of Big Island, but is actually one of the most peaceful and pretty areas. En route you pass through yet another side of Hawaii – ranch land. This includes Parker Ranch, one of the largest in the whole of the USA! At the other end of Hawai'i, a rough and windy landscape awaits. Big Island's South Point is also officially the southernmost point of the USA (and nearby Naalehu is today the USA's southernmost town). A popular hiking destination not far from South Point is Green Beach, so called because of the colour of the olivine of volcanic origin that has accumulated in a small bay here. When I was there I also saw evidence of a plague that is the Great Pacific Garbage Patch which gyrates over an area of several thousand square miles north of Hawaii and whose ground-up plastic debris sometimes reaches Hawaiian shores too. Or maybe what I saw was just regular rubbish pollution … The Hawaiian state, however, seems adamant to put a stop to littering. The roadsides are “littered” with signs spelling out fines for littering. But that won't do anything against the millions of tons of plastic already accumulated in the oceans that endangers marine wildlife. Speaking of wildlife, apart from whales, sea turtles and seals, all indigenous animals in Hawaii are birds. Land animals were all introduced by humans – and some quickly became pests (e.g. feral goats, donkeys and even geckos). The “national bird” is the goose-like nene (which looks quite like a very docile Canada goose), which needs special protection, so you'll see plenty of roadside signs to that effect, especially in Volcanoes National Park. Other avian life is more abundant and colourful. Those into bird-watching will have plenty to look out for. Culturally, Hawaii is quite an intriguing mixed bag. Obviously there are plenty of American aspects to it, from typical shopping malls to small rural churches. Yet there is also a distinct Asian, especially Japanese influence that is quite visible and widespread. The old Polynesian Hawaiian culture in general has seen quite a revival in recent decades too, after it had been largely swept away by the increasing Americanization of the 19th and 20th centuries. There are also some well maintained archaeological sites pertaining to the early settlement of the islands by Polynesians (presumably first from what today are the Marquesas Islands). One such site at South Point is presumed to be the very first place where the Polynesians arrived. Evidence of later Hawaiian culture are the various statues of Kamehameha the Great, the Big Island chief who in 1809 first “unified” the Hawaiian islands into one kingdom (except initially Kaua'i), mostly through a combination of enticement and brute military force. The legacy of Hawaiian royalty is most prominently preserved in the form of 'Iolani Palace in downtown Honolulu. The language of Hawaii has also seen a bit of a resurrection. Next to dominating English Polynesian Hawaiian is a second official language – yet there are very few proper native speakers left. Nevertheless, through educational efforts, fluency in the old language has been increased. The language is marked phonologically by a dominance of vowels and dearth of consonants. You can see this even in the spelling of place names well enough, which to western ears and minds can therefore be a bit difficult to memorize. Alongside English, Hawaiian and various immigrant languages (Japanese, Korean, etc. ), there is also a distinct English-derived creole language called “Hawaiian Pidgin” (though technically no longer a real pidgin, in linguistic terms), which is in common use amongst locals in many parts. In culinary terms, Hawaii is also American-dominated but at the same time benefits from its natural riches as well as from being such a cultural melting pot. Going beyond the usual American and international standards and fast food, you can make some interesting discoveries here. The most quintessential native Hawaiian staple is called “poi”, which is made from pounded taro. The resulting wallpaper-paste-like goo is, as they say, an acquired taste … which I tried, but failed to acquire. Another typically Hawaiian speciality, on the other hand, can be outstandingly delicious: poke (pronounced 'pokay). These days it is mostly made from raw ahi tuna and is a kind of cross between Japanese sashimi and Peruvian ceviche, i.e. the raw fish is marinated (unlike sashimi) but not in acidic lime juices that “cook” the fish (as in ceviche) but most commonly in soy sauce, sesame oil and spring onions. But there are dozens of other variants, including spicy and creamy versions as well as ones made from other fish or even vegetarian, tofu and vegetable takes on the theme, also including seaweed and samphire (known here as sea asparagus). There are dedicated poke bars in Hawaii where you can taste samples and take out your choices to eat at home or on the go. In top restaurants, so-called regional Hawaiian cuisine, making plenty of use of local fresh produce in a crossover/fusion kind of cooking, is highly acclaimed. As for drinks, the most famous export from Hawaii is Kona coffee, prized as one of the world's best. Fruit juices are naturally excellent too – though on the soft-drinks front the usual sugary brand names dominate here too. Hawaii now also makes decent (craft) beer and, surprisingly perhaps for the tropical setting, there's also the USA's southernmost winery, namely near Volcano on Big Island. The widest choice both for eating out as well as for accommodation is naturally to be found in the tourist centres, first and foremost Waikiki/Honolulu but also e.g. Kona on Big Island, where most of the tourist infrastructure is centred. Going beyond the tourist hotel skyscrapers of Waikiki and the various beach resorts, there are also plenty of lovely alternatives to be found, in the form of B&Bs, luxury lodges, simple traditional hotels and self-catering villas, cottages and cabins. Prices can be steep in high season (esp. Christmas and summer), so planning well ahead pays off. For getting to Hawaii, there isn't really an alternative to flying, unless you have your own ocean-worthy boat and plenty of time or are on one of those cruise ships that are increasingly encroaching on various maritime destinations worldwide (and which this website does not endorse – for environmental as well as cultural reasons). There are plenty of air connections, naturally from the USA especially (most from Los Angeles), but also from Asia, especially Japan and China, as well as Australia, New Zealand and some other Pacific islands such as Guam or Samoa. Most flights go to Honolulu on Oahu, but a few also go directly to Hilo on Big Island. There's a good network of inter-island flights too, so it's not too difficult to get from one island to another – at least as far as the main larger islands are concerned. Getting around on any of these islands is easiest by car, as almost anywhere in the USA. There are limited networks of public transport too, but outside Honolulu/Waikiki and possibly Hilo and Kona, the (rather infrequent) longer-distance regional bus services are mostly for locals and not practical for tourists. Cycling is possible, but is rather hard-core, given the terrain and climate. So most people go for a hire car. It's the most convenient, cheapest and easily available option. Driving on Hawaii is mostly easy and relaxed, except in and around Honolulu with its multi-lane expressways that could be anywhere in US metropolitan areas. Almost everywhere else, the routes are just two-lane roads which are naturally a bit slower. The famous Saddle Road that traverses inland Big Island between Mauna Kea and Mauna Loa has been upgraded to a very smooth highway that finally makes it possible to avoid the slower coastal routes. Speed limits in the countryside are at best 55mph, often only 45mph or 35mph. Winding, steep stretches slow traffic down further still. So you have to allow sufficient time for getting from A to B. On the other hand, many drives are exceptionally scenic, so you'll want to take it slowly anyway. Some especially steep and/or rough roads are restricted to 4x4s. Note also that in some really rural and remote areas (esp. along Saddle Road), fuel may not be available for many miles so never let your tank run too low when driving through such parts. The climate on Hawaii is mostly tropical – but there are also extremes in micro-climates to consider that range from hot and dry (in the lava deserts of western Hawai'i), wet and windy (south-east Hawai'i, Hilo and Volcano), and even harsh alpine (Mauna Kea and Mauna Loa, which in winter are often snow-capped).